Nintex for Office 365 delivers a powerful approach to connecting teams and processes across the enterprise. Integrated workflow tools, mobile apps, document generation, and e-signature capabilities streamline your work across a wide range of cloud services, apps, and content repositories. Create, share, and reuse workflows – all from within the familiarity of your Office 365 tenant. The Nintex Platform allows you to connect and expand upon the processes that span your organization. Build customized workflows, forms, and documents that extend the content and data you’ve entrusted to Office 365, breaking down barriers between the people and processes your business relies upon. Visualize and map your business processes with Nintex Promapp™ to help understand, streamline, and continuously improve the way you work. Utilize powerful features like responsive forms, mobile apps, DocGen®, e-signature, and built-in connectors to easily automate processes natively from within Office 365. Bring Nintex Hawkeye™ process intelligence tools into the fold to give you actionable insights into your process performance. Read the new Forrester Total Economic Impact™ study to understand why industry leaders turn to Nintex for Office 365 to automate their most sophisticated business processes every day. The results are significant. 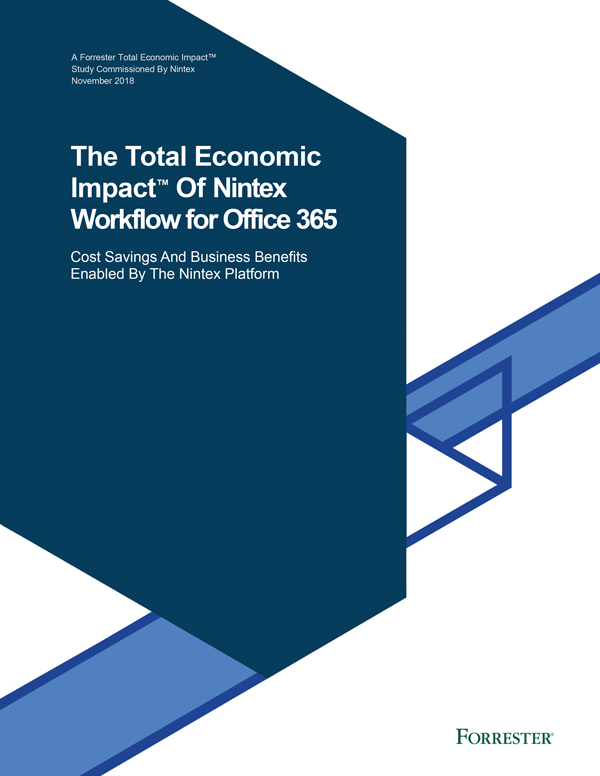 The Total Economic Impact of Nintex for Office 365, a commissioned study conducted by Forrester Consulting, Nov 2018. Take your Office 365 investment to a new level with the Nintex Platform. The possibilities are endless with deeply integrated workflow capabilities from Nintex. Onboard users into Office 365 and assign licenses. Automate provisioning of SharePoint sites, collections, and other resources. Assign and track IT help desk tickets and customer support cases. Gather and publish content to third-party repositories. Manage budget reviews and leave requests, and much more. Manage, automate, and optimize your business processes from start to finish with Nintex. Power your workflow with actions like conditional start, scheduled workflows, and advanced business rules. Create responsive forms, automatically generate and sign documents, and access your processes anywhere – even while offline – via mobile apps. Workflow for Office 365Easily design and connect automated workflows that extend your content and data in Office 365 and beyond. Forms for Office 365Quickly create custom-tailored, responsive forms using simple drag-and-drop capabilities with customization options. Your business doesn’t run on Office 365 alone. Built-in Nintex Connectors integrate the cloud services, business applications, and content stores you use every day into your SharePoint-based Nintex workflows. Chemical company saves $800,000 by automating purchase requests. Recycler drives 120% ROI with a digital compliance process. Construction firm uses cloud-based systems to flag safety hazards.